Construction sector output grew in volume terms by 10% in 2014 to €11 billion and is forecast to increase by almost 26% over the next two years according to a new report on the sector. According to the Society of Chartered Surveyors Ireland (SCSI), the professional representative body for the construction and property sector, the sector has turned a corner and prospects for the industry are brighter now than they have been in almost a decade. The SCSI’s ‘Irish Construction Prospects to 2016’ report – which was prepared by DKM Economic Consultants in conjunction with the SCSI – suggests that the growth in output will be driven by housebuilding and commercial property activity. 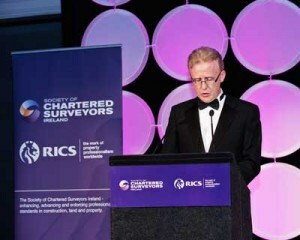 Andrew Nugent, incoming President of the Society of Chartered Surveyors Ireland (SCSI) said; “The fact that the sector grew by 10% is positive and reflects improved economic conditions and confidence in the sector. However, the growth is still coming from a relatively low base and current output represents approximately 7% of GNP, which is still well below the 12% of GNP deemed to be a sustainable level according to European standards”. Nugent also raised concerns about the actual levels of housebuilding completions recorded each year and said that the SCSI has reduced its housebuilding projections by around 20%. “The official housing completion figures show that 11,016 units were completed in 2014. However, the commencement figures are far lower and this suggests to us that the actual level of housebuilding is actually lower than the completions figures suggest. This is due to the fact that the completions figures are based on the number of units connected for electricity. “It is our view that up to 20% of the units connected for electricity last year were actually built in previous years and were properties in receivership or in NAMA. On that basis, we believe that the actual number of new units built in 2014 was around 8,900 and that it will be around 10,000 in 2015 and 14,000 in 2016. This is significantly lower than other published projections and indicates that the new housing supply issue is even more serious than previously thought”. Nugent said that the new Building Control Management System which is used to track commencement notices and certificates of compliance through the housebuilding process would provide an opportunity to track the exact number of units built each year. The SCSI called for the speedy implementation of the Government’s Construction 2020 strategy to address supply issues and to reduce the barriers to development. “The Government has set out a very positive strategy and made some welcome stimulus announcements and we believe that by implementing the reductions of Part V development levies and ensuring greater provision to sustainable development finance, the sector can achieve greater levels of output and create more employment”. The SCSI highlighted the need for a review of other costs of new house building which are impacting the viability of developments proceeding. “Approximately 20% of the cost of a new home is due to taxes and we believe that a temporary measure such as reducing the VAT rate on new homes would result in more housing being built”. The SCSI also called for a review of the Dublin City building development standards which are far more onerous than the national standards. “We recognise the need for high standards in building development particularly from a safety perspective, but there needs to be a degree of flexibility on issues such as whether underground car parking is needed, minimum sizes and allocation of units per core which greatly exceed many other European cities. If we are serious about facilitating more supply of rental accommodation and reducing the pace of rent increases, these issues must be addressed”. According to the SCSI, the key challenges facing the construction sector remained access to development finance and also a lack of skilled people to meet industry capacity requirements. “There has been a decline in the availability of skilled tradespeople, specialist contractors and graduates entering the sector. While we were pleased to see a 27% increase in CAO applications for built environment courses, it will take several years for this to feed through into the sector” Nugent said. The report also highlighted the anticipated output of commercial property which is projected to be around €3.5bn over the two year period 2015-16. SCSI members also pointed to the shortage of prime office space in Dublin which is driving rents for commercial space upwards. “The increase in rents due to a lack of supply is concerning but now that rents have reached a level where it makes economic sense to build again, we expect to see more commercial developments come on stream over the next 12-18 months. We must be careful to start planning our developments on a more regular basis to avoid the ‘boom-bust’ approach which causes excessive rent inflation and uncertainty in the market and continue to maintain our competitiveness”, concluded Nugent. The report is available to download here.